Coachella Music & Arts Festival is known for its unique street style. I went in 2015 & 2016 so I have a first-hand account of Coachella fashion. This set is kind of a mosaic, bits & pieces of trends that I witnessed over & over. Looking for Coachella outfit ideas for women? 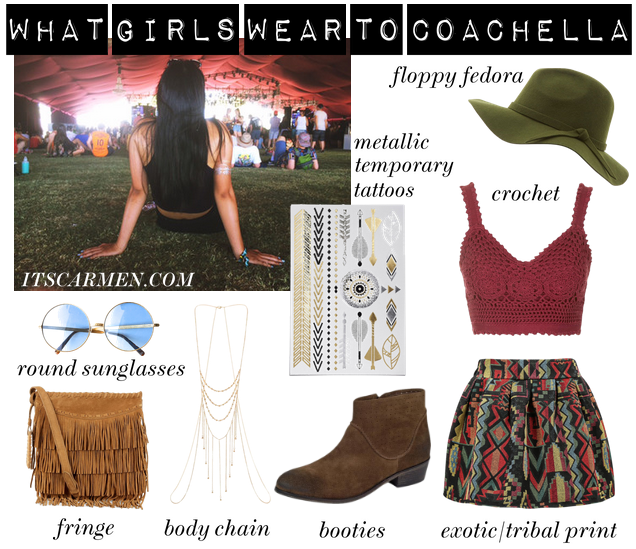 Use this formula to create your own Coachella music festival inspired outfits. Click here for more Coachella outfit ideas. You'll need some element of crochet. A crocheted top or a crochet cover-up will work wonders. Make sure to acquire your coolest exotic or bohemian inspired print. The most popular shoe that I saw were the ever famous booties or even a chunky booty. Booties a are a kind of a mini boot with a low cut & a low heel. Great for walking around, especially since they're close-toed. Add some fringe in your life to get that boho Coachella music festival style. From your faux suede fringe purse to your fringe tassel jacket. I even saw some fringe booties! Accessorize your look with a floppy fedora. I'm not sure how to describe it other than a fedora but with a floppy brim. Go for a crochet fedora or a straw panama fedora. Get your most 70s hippie-looking round sunglasses. The more whacky the color the better, like these round retro rainbow sunglasses. Buy metallic temporary tattoos & adorn your body with several of them. One is not enough! This was a very prominent trend as far as women's Coachella fashion for 2015. The body chain is a simple way to have jewelry all across your body. It doesn't have to be strictly necklaces or bracelets. A rhinestone bra or a tiered thigh chain will do. Or maybe both. Ugh yes love this haha. I overall wear festival outfits pretty much all year round, it's just what I really like. I love the body chain you've featured in this post. I'm yet to try one myself, but I'm seriously considering a subtle one for the summer! :) I'm glad you went to Coachella this year as so many people seem to have been disappointed they couldn't attend! I'm in love with that hat! That skirt is pretty fantastic too. Great picks!! Love that fringe bag!! You captured to Coachella look for sure. 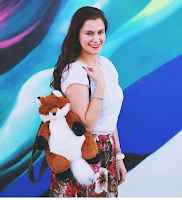 These are some cute finds that can easily be worn on the day to day, too! I actually like all the things above, but if I had to choose only one I would go with exotic/tribal print, but that's just because I feel like it represents me better! I would definitely have worn that outfit if I went to coachella! Those tribal shorts are AMAZING! Want. Actually I'm loving this whole outfit. My favorite element is definitely the hat because I hate the sun in my eyes and it's so stylish. I have a few floppy hats that I love. Great inspo! I love that crochet top and the tribal shorts! I've never attended any music festivals but I sure do wish that I had, they always look like so much fun albeit hot and sweaty. Nice tips, that crocheted top is wonderful! I haven't been to a festival in ages, but I remember it always being a lot of fun. Which bands did you see? Yes, you are spot on! Must have been so fun to be there this year! A good hate and pair of sunnies is essential to any event that is held outside in the sun for hours, gotta beat the heat and get as much shade as possible! Great picks! Awesome post!! You're so lucky to have been to Coachella!!! I love all of your recommendations! I plan on going next year so I will definitely use this! This post is so on point Carmen! I definitely gained some inspiration for the upcoming summer festovals! And I would love to get my hands on those metallic temporary tattoos! They look so cool! Amazing post,love this style,wish I wear like this every day,xoxo. Definitely love the crochet top - anything crochet is a winner in my eyes! I just realized I dress with at least one element everyday from this list HAHA!